– Morning class 8:15 a.m. to 12:00 p.m.
Each of our Montessori Primary Classes is a balanced, mixed age group of 3-6 year olds. The rich classroom environment fosters developing leadership skills as the older, more experienced students mentor and help the younger ones. The curriculum and prepared environment encourage responsibility, accountability, cooperation and critical thinking skills. Our AMI certified teachers help the children learn about the world they live in. Concepts are learned at the child’s own pace, using hands-on sensorial exploration of the unique Montessori materials. Sequential lessons in the different curriculum areas are presented to each child when appropriate for their individual development. 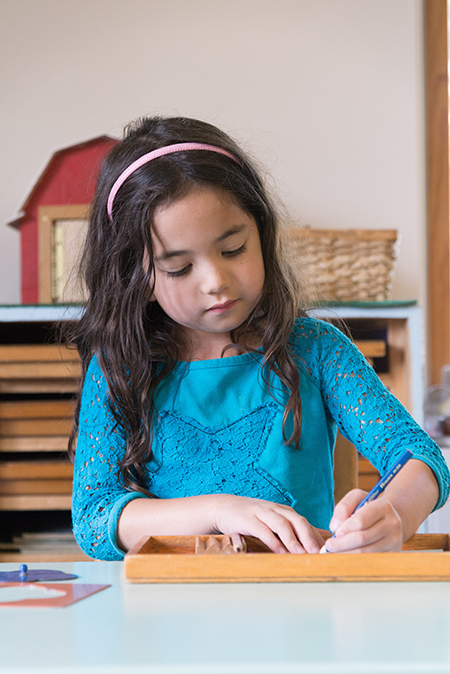 Academic concepts are learned through work with the unique Montessori materials. There are five main integrated areas of study: practical life, sensorial, language, math, cultural studies/geography. The children are engaged in a wide variety of work. Primary level classes are truly “Children’s Houses.” At any given time you can see the span of lessons from simple lessons in Practical Life to the more advanced lessons in other curriculum areas. It is a very joyful, active and social community of children having fun, while learning important life lessons and skills.